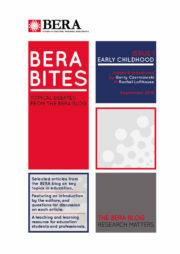 This collection on early childhood, the first in the series, offers contemporary insights into understandings, trends and dilemmas around educational policy and practice in the early years. Inside, you’ll find discussions of accountability, ‘datafication and hyper-governance’, the fundamental purpose of early years services, the pernicious encroachment of summative assessment into the reception curriculum, the contradictory meanings of ‘play’ to children and policymakers respectively, and the positive impact of music education on wellbeing across the life-course. One article describes a project that has empowered staff to develop better and more inclusive systems to meet children’s speech, language and communication needs; another asks, ‘Why is it that even in schools that explicitly value children’s home languages, children may become reluctant to use their language in the classroom?’. Further pieces consider the difficulties facing professionals in the early years sector in the context of the government’s workforce strategy, while another problematises the CPD needs of early years educators in England. Others engage with the question of how to gain children’s consent to participate in research; the benefits of using the Tavistock method of observation to support reflective practice; and the undimmed effectiveness of Dorothy Heathcote’s ‘mantle of the expert’ approach to learning.